Home » Posts tagged "24 Merchandising Duties"
Merchandising plays the most important role in the apparel industry, merchandising general procedures are sourcing garments order, making a sample, price negotiation, price confirmation, order confirmation, fabrics-trims, and accessories booking, Fabrics-trims and accessories in-house and arrange QC file. Merchandising fills up the gap between garments manufacturer and buyer. So, if you are a stakeholder of the apparel industry then you must have the idea of merchandising duties and responsibilities in a garments factory. This article is all about merchandising job description what a merchandiser does in garments factory as a senior merchandiser or merchandising manager, clearly described product development to shipment process in below. 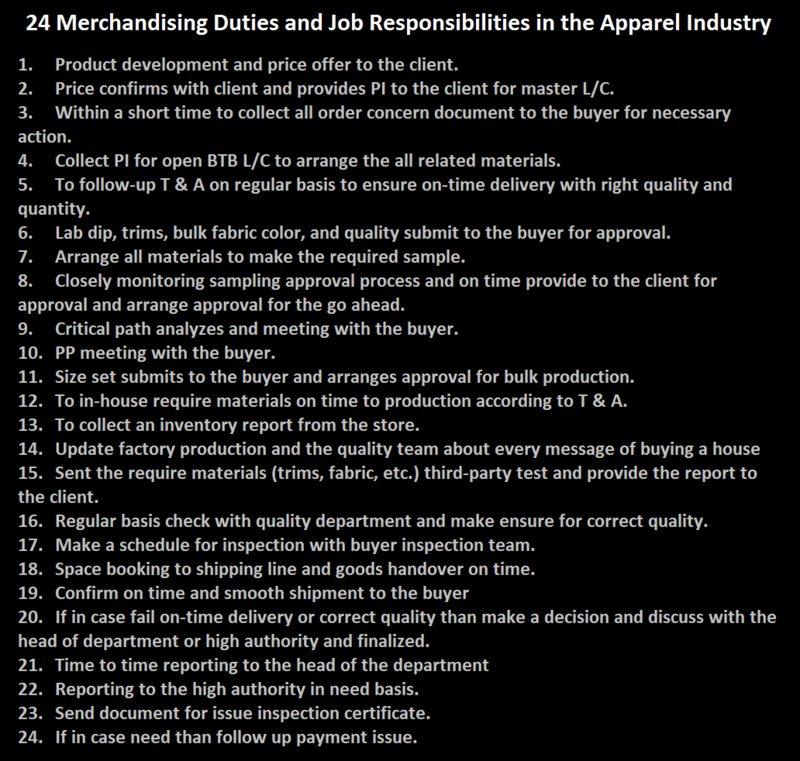 Hope this article would help you to clarify about merchandising job responsibility in the apparel industry. Product development and price offer to the client. Price confirms with the client and provides PI to the client for master L/C. Within a short time to collect all order concern document to the buyer for necessary action. Collect PI for open BTB L/C to arrange the all related materials. To follow-up T & A on a regular basis to ensure on-time delivery with the right quality and quantity. Lab dip, trims, bulk fabric color, and quality submit to the buyer for approval. Closely monitoring sampling approval process and on time provide to the client for approval and arrange approval for the go ahead. Critical path analyzes and meeting with the buyer. PP meeting with the buyer. Size set submits to the buyer and arranges approval for bulk production. To in-house require materials on time to production according to T & A. To collect an inventory report from the store. Sent the require materials (trims, fabric, etc.) third-party test and provide the report to the client. Regular basis checks with the quality department and makes ensure for correct quality. Make a schedule for inspection with the buyer inspection team. Space booking to the shipping line and goods handover on time. If in case fail on-time delivery or correct quality than make a decision and discuss with the head of department or high authority and finalized. Reporting to the high authority in need basis. Send a document for an issue inspection certificate. If in case need than follow up payment issue.